The Student Ability Success Center Advisory Board (SASC SAB) was established to represent the voice of students with disabilities at SDSU. The board reviews and makes recommendations regarding policies, programs, and procedures within the Student Ability Success Center (SASC) Office. 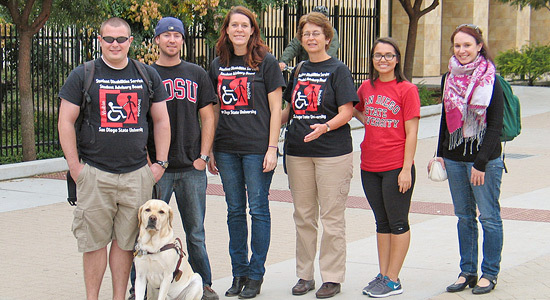 This group also works to promote disability awareness at SDSU. The SASC SAB is comprised of students with and without disabilities, as well as a faculty and a staff advisor. The board holds open meetings in the SASC Conference Room in the SDSU Calpulli Health Center at 11:00 am on Fridays during the Fall and Spring semesters. If you are interested in learning more about the SASC Student Advisory Board please contact Teresa Spoulos, Staff Advisor, at tspoulos@mail.sdsu.edu or 619-594-4401. Teresa can also provide a membership application if you are interested in joining the board. Students from all academic majors are encouraged to apply.